I love to paint. I know some people just hate it and would rather hire someone to do it, but I just loooove seeing a room become new again with every brush stroke of color. The whole prep part I really dislike, but other than that, I actually get really excited to paint a room. Painting provides endless possibilities! I have painted quite a lot in my day. I’ve helped my mom paint many rooms in our house growing up, and now that I have my own house, I’ve painted all of that, too. My amazing mom has most definitely painted her fair share of rooms, so I picked her brain on some of the things she’s learned in all her years of experience. 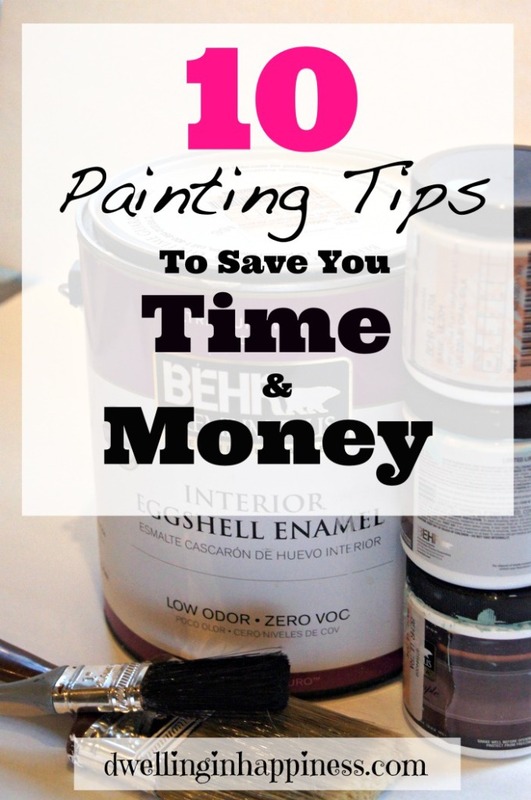 Together, we came up with these 10 painting tips to help you save time and money! Before you go out and buy your paint, make sure you’ve done all your research. It’s important to measure your room to get an idea of how much paint you’ll need. To estimate the amount of paint needed for your room, add together the length of all the walls. Multiply that number by height of the room (measure from floor to ceiling). Now you have to determine how much of that square footage is paintable surface area. Because you will use a different paint on the doors and windows, subtract those areas from the room total (You can just subtract 20 square feet per door and 15 square feet per average sized window in the room – these are average measurements). You’ll end up with a number that is pretty close to the actual wall area you’ll have to cover with paint. For more help, Behr has a fabulous and easy paint calculator that you can plug your measurements into. See it HERE. Usually you can expect 1 gallon of paint to cover about 350 square feet. You’ll need slightly more than a gallon if the walls are unpainted drywall, which absorbs more of the paint. You also need to consider whether to paint more than one coat. If you’re painting unfinished walls, heavily patched, or dark in color, plan on applying two coats of paint for sure. Make sure you also know what supplies you’ll need as well. Do you need a roller, or a small brush? Make sure you also invest in good brushes; they’ll last you longer and will cost you less in the long run! This was totally foreign to me when I first started painting. Paint finishes? Isn’t all paint the same? It’s totally not, my friends! Paints come in a wide variety of finishes: flat, satin, eggshell, gloss, high gloss, etc. 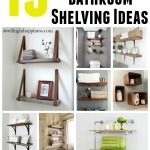 Each serves a purpose for different rooms/furniture pieces. For example, flat paint is reaaaalllly hard to clean. It’s nice because it doesn’t have any shine, but it shows a lot of flaws (if any) in the wall or furniture because it doesn’t reflect the light. So, based on that, you’re not going to paint your child’s bedroom with flat paint when they’re probably going to be scuffing up the wall and inevitably using their markers on it to draw you a pretty picture. You’d have to paint over it all again and again to keep it looking nice. 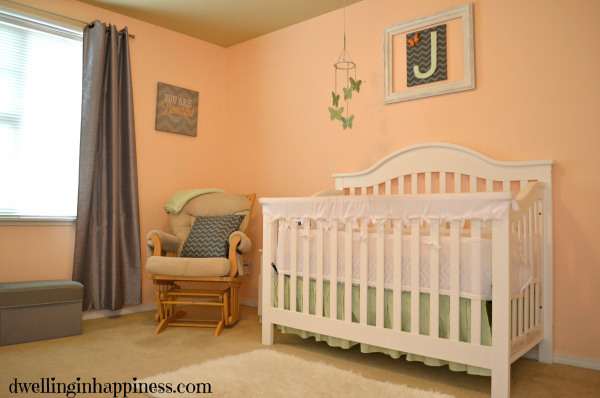 For your child’s bedroom or a place with high traffic, you’ll want to use an eggshell or satin. It has a little shine, but is a lot easier to wipe down and clean! If you’re not sure about paint finishes and what kind you’ll need, Behr Paint and Bob Vila have great information to get you going. 3. Use Those Free Paint Chips! Once you’ve narrowed down your few favorite colors from the paint chips, go back and get a couple of small sample tubes of those colors. Paint them on your wall next to each other in fairly large sections. Make sure you look at the colors at different times of the day. They may look different depending on lighting and where the sun is. A color may appear to look white with a light on in the room at night, but when the sun shines in on it in the morning, it might appear beige which can change the look of the whole room. sit on it a few days before deciding so you don’t choose a color you end up hating, only to have to spend more money and time repainting! Our tendency sometimes with paint is to go the safe route and get a neutral color. I’m all for neutral, but don’t be afraid to go bold! Having an accent wall of a bright color can really add some dimension to a room and give it a little extra character. We chose a neutral gray for our living room, but I painted an accent wall green for fun. I recently painted over it with the same gray paint to match, but I really loved having something different as a focal point in our huge living/dining room area. There are so many beautiful bright colors out there. BE bold and GO bold! Check out Behr’s 2015 Paint Color Trends for inspiration on some bright and fun colors! I know this may sound like the opposite of saving money, but it’s truth. When we moved into our house, we were on quite the budget. 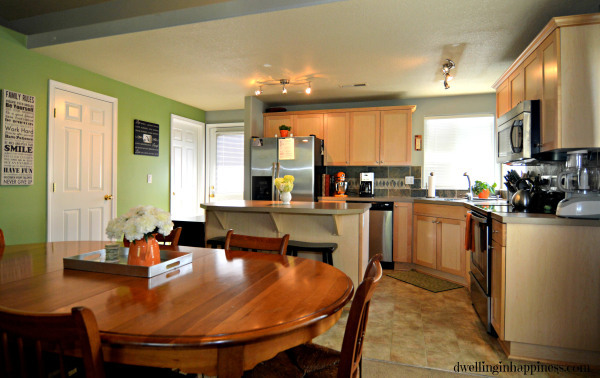 I really wanted to paint our living room and kitchen gray to get rid of the ugly yellow beige color we had, but didn’t want to spend a ton. So, I went and got the cheapest paint I could find. Let me tell you; though it’s tempting to save a buck, it was NOT WORTH IT. We ended up using a ton of paint, and I had to go back and get two more gallons just to finish. It also was super thin, and we needed 3 coats just to cover up a light beige! And since then, there’s so many little chips here and there from things banging on the wall. Even hanging birthday decorations with tape ripped off the paint when we pulled them down. Moral of the story? Use QUALITY PAINT! It might mean it costs more, but you’ll use less and save more in the long run. It’ll go on smoother, cover more evenly, and last so much longer. 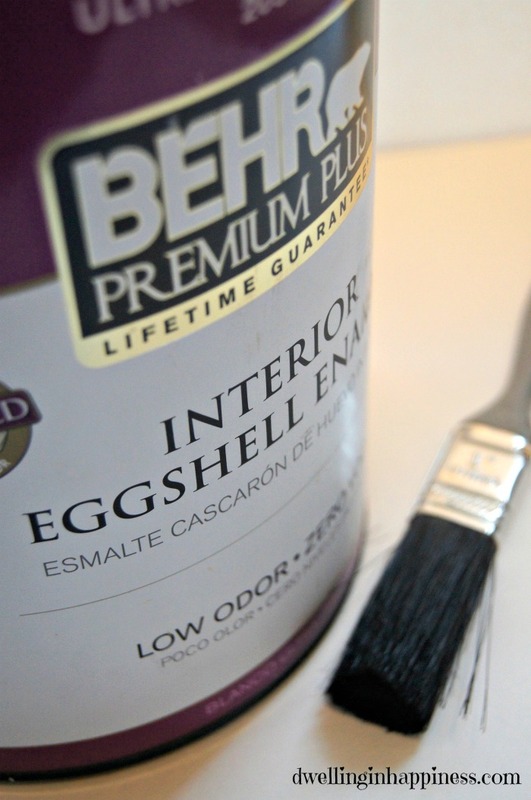 Behr is the only brand we use now, and they have fabulous quality paint! Always start painting from the highest area to the lowest. Start from the ceiling or top of the wall and work your way down. This way, you’ll catch any drips or splatters, and you won’t ruin your beautiful freshly painted wall! It’s tempting to start by rolling on a super thick coat to help with not having to do another coat, but that doesn’t always work. Painting a thin coat is better than loading up your brush or roller and getting too much paint on the wall. Otherwise, you’ll have drips and the paint won’t look as even. A second thin coat will cover anything you may have missed the first time around, and it will look much more even! This might just be our preference, but we’ve found it’s a lot easier to paint the whole wall first, then go back when that’s dry and paint the baseboards and trim. When you’re rolling the paint on the walls, it splatters all over and can get on the trim. Even with tape, it still can splatter or drip on the untaped places. 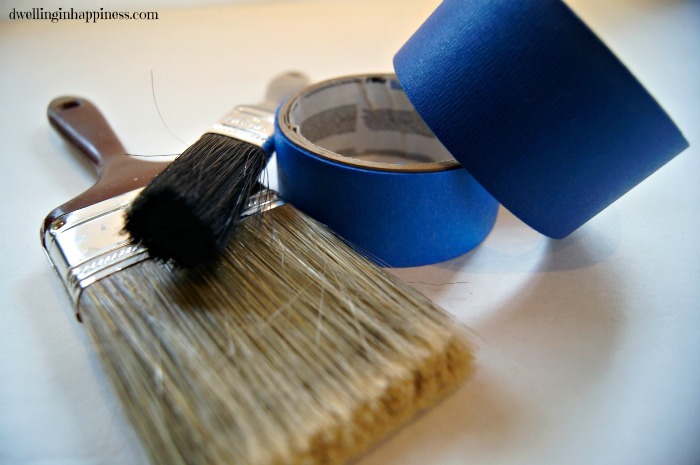 You can easily use a small brush and paint the trim without worrying about the other paint colors dripping in. These are just some of the things we’ve learned in our painting endeavors, but I hope they can help you save some time an hopefully some money next time you have some painting to do! Do you have any paint tips? I’d love to hear them! Great tips, Amanda! I used to be guilty of not understanding paint finishes and did several rooms in flat. It’s definitely not a kid-friendly finish! Thanks so much for linking to our tutorial for cutting in too!! You’re the best! Thanks Rebekah! Totally, quality paint is a must! Sometimes I guess we just have to learn the hard way. 😉 Hope your day is going great! SUCH great tips Amanda!!! With a whole house to paint, I’m definitely going to be putting these to work! Thanks, Kristi! Absolutely, you have a nice blank canvas to work with, how fun!! 🙂 Hope these tips help a little! Yes you would think!! I’m sure it was just a money saving thing. Unfortunately with building, unless you pay for upgrades for EVERYTHING you get super basic everything. Had we known they were doing FLAT, we would have upgraded or came and painted ourselves! You live and learn I suppose!! Absolutely, unfortunately they often try to take the quick and cheap route, cutting corners and doing a not-so-great job! Which is sad. I guess we should always just DIY then! 😉 Hope you have a great weekend, Natalie! Not only am I super duper honored for the link love to my Ombre Paint Chip Earrings (thanks, Amanda!) 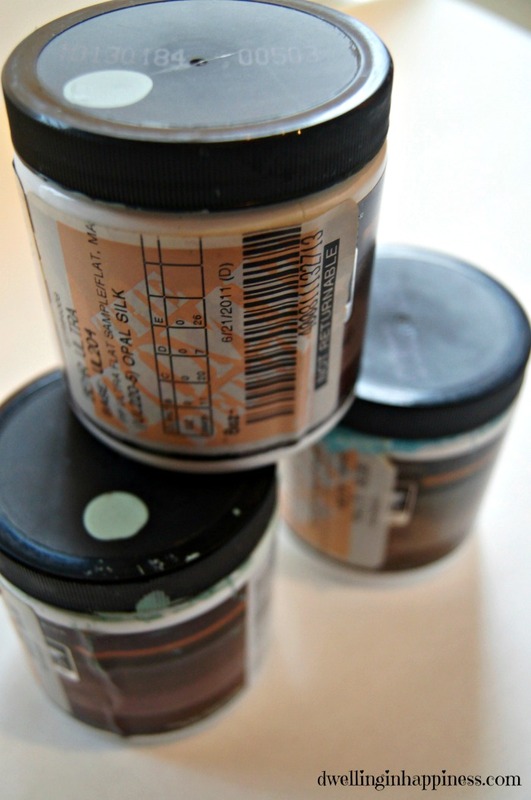 but I’m sucker for painting tips…so thanks for sharing these gems with us! Though it may have seemed obvious to some, the high to low tip is one I never thought of before. Off to pin! Thanks, Lauren!! I LOVE those adorable earrings, I was so happy to reference to them!! I seriously want to go get every paint chip there is and make a ton! One for every occasion. 😉 Thank you SO much for pinning! Hope your week is going lovely, friend! Great tips, Amanda! I must admit, last time we hired painters to paint our home but I’m ready for a new colour and would defiantly do it ourselves! Will keep these in mind! Have a wonderful weekend, friend! Thanks Kendra! There are definitely times when I am tempted to hire someone, too… HA! But most of the time, I really love painting. Maybe I just need to hire someone to do the prep for me. 😉 Hope your weekend is great! 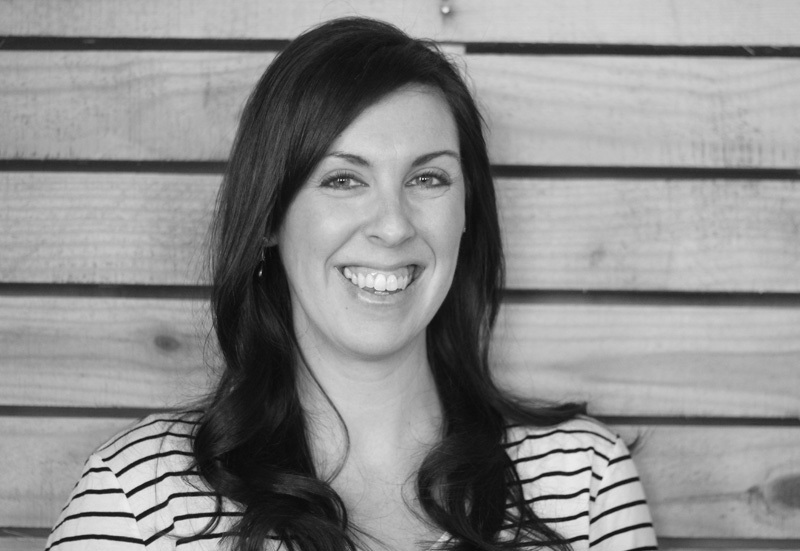 Saving this post…so many great tips! Thank you, Amanda! 🙂 I hope they can come in handy for you down the road! What about washing the walls? The ONLY time I painted I was told to use- I think TSP. I just did what I was told, not knowing to while it off!?! Turns out you can have problems even with quality paint. . . So. . . Do we need to wash the walls? That’s a great point! I have never personally used TSP, but it can help in some cases if your walls are really grimy or dirty. I’ve found that just wiping them down with either soap and water or just a damp towel works great. Then let it dry. And, I don’t always even wipe the walls down! I think it depends on what and where you’re painting. But, to be safe, just a quick wipe down with water should do the trick! I should have added that in the tips, thanks for reminding me! 🙂 Hope that helps! Great tips! I always used to think buying the samples were a waste of money, but it really does save you from buying a color you end up hating. Yes, speaking from PLENTY of experience lol. Plus when you are through, you can use those samples on a number of projects! Pinned and shared on G+! Have a great week! haha. well, well. I keep finding your posts! Great tips. My husband is the painter of the family, he does amazing and enjoys it (score!) but I want to tackle some smaller projects while he’s working instead of having to wait for him. I will def keep these tips in mind. Ha, thanks Jamie! So funny, my hubby is totally NOT the painter in our family. He tries, but he hates it… and I usually end up going back over what he paints. Shh, don’t tell him. 😉 I hope these tips will help you in your painting projects! HI there! This is awesome! 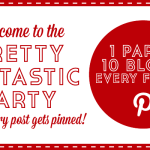 So awesome that we are featuring it at our WEEKEND WIND DOWN LINK PARTY! 🙂 Thanks for linking up with us! Have a great day! Aw, thank you Danielle!! I SO appreciate the feature! Hope your week is going great! Great tips, Amanda! I’m headed out to buy some sample pots today 🙂 Thanks for linking up at Creative Spark. Hope you’ll join us again this week! Thank you, Emily! Sample pots are the best. Especially when they double as paint for other crafts and projects later on! 🙂 Have a great day! All these are great tips Amanda! All the houses we are looking at buying need to be painted and I HATE painting… but maybe now that I have a guideline of what to do I can find it more enjoyable. Thanks so much for sharing with us at Talented Tuesdays. I hope you join us again next week and I hope you have a great rest of your week friend! Thank you, Sydney! 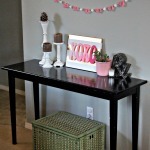 I hope these tips can help a little when you settle on a house!! Painting CAN be fun.. 😉 Hope you’re week is going great friend! Man I was just reading your comments, you have been featured a lot with this post! How exciting!! 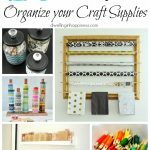 So many great tips all in one post, my kind of thing haha. Ha, thanks Jess! Everyone needs some painting tips once in a while, right? 🙂 Hope you’re having a fab day! 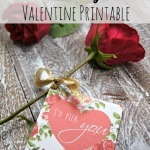 Lou Lou Girls recently posted…DIY Heart Valentine’s Envelopes! Thank you! I appreciate the pin! 🙂 Hope you have a great night! I’m with you, I like to paint but not do the preparation. Great tips. Thank you, Emily! I hear ya, I used to paint the trim first for a long time, too! But I was always dripping when I’d paint the rest of the wall! Oops. 🙂 Glad these tips could help! 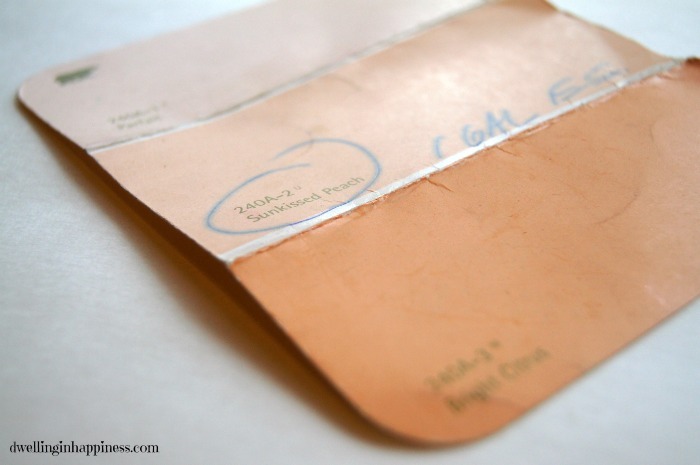 The third tip about using the free color swatches from hardware and painting stores seems incredibly simple, but it’s often a step that’s overlooked. Painting a room, especially a large one, can be overwhelming, but having to do it twice because you selected a color you weren’t sure about is a nightmare. By using a color swatch, you can match it to pillows, curtains, and any other patterns you may already have in the room you want to paint, which makes matching colors far easier. I need the interior of my home re-painted. Sadly, I am wheelchair bound and cannot reach the high points of the walls or ceiling. Can I buy the paint and then have the painters do the job for me? My hope with this is that it will save me some money on painting services. Amanda, it seems like you sure know very well about painting walls.Tip 10 sure got my attention since I am thinking about telling that to the wall painters who are coming to my house. Part of their project would be to paint all the rooms of my home. That’s a great tip to bring home the free paint chips. I like the idea of bringing the colors home and making a decision there. There have been times in my life where I’ve felt pressured in the store. I like making decisions better in my own house! I totally agree with your tip to use quality paint. It’s easy to think that cheap paint will save you money, but there’s a reason it’s cheap. You won’t end up saving money if you have to use three times as much paint to cover the area, only to have it chip off soon afterwords. Thanks for the tips. I am looking to repaint my bedroom to get rid of all the nail holes and change the plain, white color. I have never painted a room by myself before, and I really appreciated this list especially the idea of trying out a few paint samples. I really want to pick the right color, so I think this tip will really save me money and stress! I am definitely going to use the advice to paint from high to low and paint the trim last. Thanks for such a helpful list. I never realized how many things there are to know about painting before beginning the process. I would agree that having the right materials for the job is essential. Samples of colors would be a perfect way to find a color that you like without purchasing several paint colors. Nothing is worse than making a mistake while painting. I definitely agree that those free paint chips are important to avoiding mistakes! It’s great to be able to see what the paint will probably look like before actually painting. Go Bold! Awesome advice for paint color and life itself. We recently had to make the choice between a plain off-white and a more striking tone of blue – we chose the blue and everyday since we’ve been thankful for doing so. It does so much more for the room – now we’re trying to decide what next. lol. Thanks for the article! These are great tips! Prepping can make the biggest difference. Getting high quality–I really had an unfortunate experience a few years ago when I used some cheap paint (I thought I was clever). Yeah…not a wise idea. on rope installation Brisbane recently posted…Hello world! My husband and I have talked about hiring a painter to do our living room. I didn’t even think about finding quality paint before we hire someone. It didn’t really occur to me that the type of paint could make a difference. I would rather have a paint that lasts a lot longer than something that is cheaper. 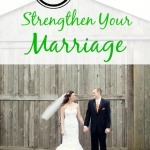 I appreciate your post, Thanks for providing so much information and all of the great tips! I had no idea about some of these but it is always great to learn something new. Thanks for sharing. Great painting tips! Before applying paint , one should remove the old paint properly and clean the wall, then only new paint give you bright finishing. Such a beautiful home! The paint color you added makes it absolutely stunning. Thanks for providing so much information and all of the great tips! I had no idea about some of these but it is always great to learn something new-especially when it comes to home appearances! Thanks for sharing! Thank you, Marcus! You can never have enough paint tips! 🙂 Thanks for stopping by! Thanks for giving us this very useful tips and tricks. Now I can paint my house fast.